Google is a funny organization and they celebrate most of events we love, in a geeky way. 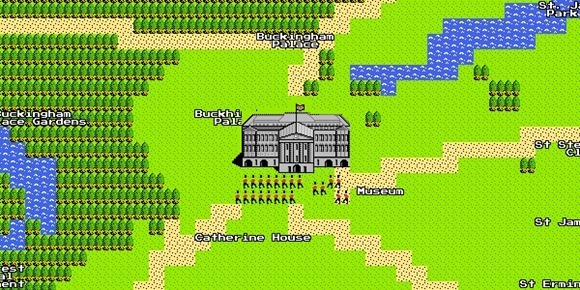 On the occasion of April Fool’s day 2012, Google released 8 bit Google Maps for Nintendo Entertainment System(NES). Here is the screen grab of Buckingham Palace, on 8 bit Google Maps. For those who are not aware of NES, it is XBox of 1980’s. NES is considered one of the most influential video game systems ever produced. Released in 1983, NES conquered millions of gamers heart and had a long lasting impact of 20 years. In the year of 2003, Nintendo finally stopped production of NES. If you interested to take a tour the 8 bit Google Maps, go to Google Maps and click on the quest button available on right top corner. The guys at techi.com has a good collection of screen grabs taken from 8 Bit Google Maps, check it out here.